For some, a simple dental procedure can completely upgrade their life. If you’re missing teeth or suffering from dental problems that contribute to your broken smile, those are factors that could affect every part of your life. Whether you have a tooth that is ruining your smile or are missing teeth in your mouth, it’s important to know that there are procedures that can help. Discover three of the most popular dental treatments and see why they have life-saving potential. Since our smiles and our abilities to eat and speak are connected to every part of our lives, a dental procedure that restores those elements can be an extremely valuable upgrade for some patients. Learn about three dental procedures that have improved the lives of numerous patients. Essentially a thin, ultra-hard shell that bonds to the front of your teeth, veneers are an extremely popular cosmetic treatment. Even if you have irreparable damage to your teeth, a veneer can hide it, restoring the appearance of a complete and natural smile. As one of the most versatile cosmetic treatments, there are a lot of conditions that can be improved with porcelain veneers. Why Will Veneers Change Your Life? Veneers have the potential to vastly improve your life because they can hide teeth that are ruining your smile. By restoring your smile, your confidence and self-esteem will rise along with it, giving you a new lease on life. Another versatile treatment that has the potential to vastly upgrade your smile is Same Day Crowns. Dental crowns are designed to fit over damaged teeth, adding significant durability and restoring a natural appearance. Enhancing their convenience is the fact that these crowns can be customized to your needs in just a single visit. Why Will Dental Crowns Change Your Life? If you have teeth that are severely damaged, it’s going to take a toll on your quality of life. From not being able to eat the foods you want to experiencing pain and problems with speech and appearance, just one faulty tooth can create a lot of problems. Fortunately, dental crowns can restore lost aesthetics and function in just a single trip to the dentist! Are you aware of the dangers of living with missing teeth? From the misalignment of remaining teeth to the shrinking of the jawbone, there are a lot of reasons to seek a replacement. Of the three options for replacement, only dental implants have the power to preserve the jawbone and keep it from shrinking. With tons of advantages and a success rate that exceeds 95%, dental implants are the ultimate treatment for those with missing teeth. Who Benefits Most from Dental Implants? Why Will Dental Implants Change Your Life? For patients who are missing teeth, dental implants will provide more of a boost to their quality of life than any other procedure. By restoring the ability to speak clearly and eat the foods you want, patients can expect noticeable improvements to all aspects of their lives. Combined with the fact that they restore your natural-looking smile, dental implants are the absolute best way to replace missing teeth. Like the abilities to eat and chew, our smiles have an affect on every part of our lives. Restoring these abilities can be a massive boost to the quality of life of our patients. Prioritizing comfort and convenience, Dr. Diane Sherman is highly-experienced at using advanced treatments to restore patients’ smiles. 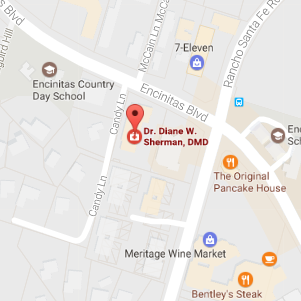 Contact our office today in Encinitas, CA to schedule an appointment.